Have you ever stopped to wonder why some women in their golden years look like Tommy Lee Jones and others have the skin of someone thirty years their junior? I know I have. In a lot of cases plastic surgery has something to do with it but in others it doesn’t. If like me you don’t fancy having weekly injections or going under the knife what can we learn from these forever youngs? A lot is the answer. Read on below and I’ll take you on a whistle stop tour of some of the step you can take to understand How to Have Healthy Glowing Skin now and well into your advanced years. How much water did you drink today? I already know the answer – not enough. If you want to have healthy happy skin you need to keep well hydrated. Have you ever seen one of those nature documentaries where after months of drought the elephants finally come across a watering hole and they go crazy? That’s exactly how much water you need to be drinking on a daily basis. When we sleep our body regulates the levels of water in our system, it draws water from here and gives it to there. It makes sure the areas it sees as most essential receive sufficient hydration. Alas, our skin is not seen as one of those essential areas. If you hit the hay in an even a mildly dehydrated state, your body is going to draw water away from your beautiful visage to keep other areas watered. Our skin is like a garden, when it’s well watered it flourishes and blooms. When it is neglected it withers, cracks and dies. Nothing, and I mean nothing, is better for your overall health than sleep. Good sleep is like a natural performance enhancer for every part of your body. Including your skin. Did you know that it’s while we slumber that the body produces collagen? “Hmmm, collagan why do I know that word?” I hear you say. Well, it’s because artificial collagen is the substance all your favourite celebrities are injecting into their face every other week in a battle to fight off old age. They could save themselves a small fortune by just sleeping better. While you lie there dreaming of Chris Hemsworth asking you to help him apply suncream, your body is pumping out collagen which keeps your skin plump and youthful. For the process to work effectively however you really need to be getting good quality deep sleep for at least 7 hours a night. Patricia Wexler, MD, a dermatologist to the stars in New York believes that getting just 5 hours a night can lead to twice as many fine lines as sleeping 7 would. Eek! Time for bed methinks. We spend a mind-boggling third of our entire life sleeping, or at least trying to sleep. That’s longer that we do anything else. Longer even than the amount of time we spend scrolling through Netflix trying to work out what to watch next. It stands to reason then that how we sleep has an impact on How to Have Healthy Glowing Skin. It is after all called ‘getting your beauty sleep’. Well, it turns out sleep has everything to do with how we look. We’ve already covered collagen above and now we’re going to talk about pillows. Yep, pillows. Our fluffy white friends. If you sleep your your stomach you spend a third of your life mashing your beautiful face directly into your pillow. No matter how clean your pillow may look, it’s not. Well, not unless you change your bedding every single night you weirdo. Pillows collect skin, sweat, oil and remnants of whatever moisturiser you’ve applied as part of your skincare regime. This concoction is then slathered back onto your face everytime you go to bed. Lovely! The solution, sleep on your back looking up at the stars. Now, changing sleeping positions is not always as easy as that. It takes a little bit of work to get right. But the benefits are enormous. Not only will your skin stay fresh and healthy for so much longer, your back and neck will also sing to the heavens for the sweet relief you’ve delivered to them. Sleeping on your back is great for your entire body. 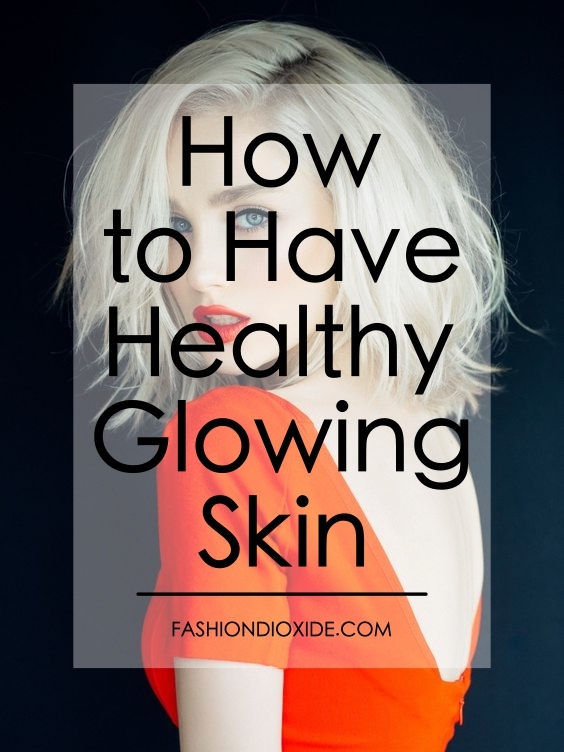 Well there you have it my beauties, three top tips on How to Have Healthy Glowing Skin and how is it that you can revitalise your skin and keep it looking fresh and new for longer. The best bit, there’s no need to get any plastic surgeons involved. Save your hard-earned money and spend it on a beach holiday to Australia instead. Who knows you might meet Chris Hemsworth there? Dare to dream girls, dare to dream!